The Esigo 3 wooden champagne pupitre is a classic and stylish design for champagne and sparkling wines. From the pupitre and remuage, the art of gradual turning and inversion of wine bottles, has inherited the module which allows you to position the bottle with the neck pointing downwards. 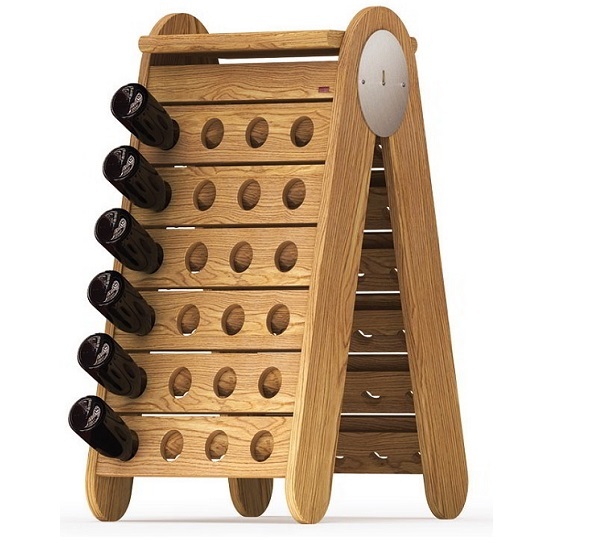 The Esigo 3 wine racks once again use the prestigious solid oak materials, the quality of workmanship and the care of the details that only Made in Italy products can guarantee. It is a classic style furnishing accessory to furnish wine cellars, but it is also capable of giving its best in public facilities such as wine bars, restaurants, wine shops and wineries tasting rooms and retail shops, where it is able to create suggestive perspectives. It is flexible and capacious, storing up to 48 of the finest wines; when necessary it can be turned into a service and tasting unit for Champagne or classic Champenoise method wines. The bottles are stored individually allowing fetching the needed bottles easily without disturbing or re-arranging other bottles.